Brian Del Signore is the Principal Percussionist and Associate Principal Timpanist of Houston Symphony. He joined Houston Symphony in 1986. Mr. Del Signore performs continually in Houston, and has toured Europe and Japan with the Houston Symphony, as well as with the Houston Symphony Chamber Players. 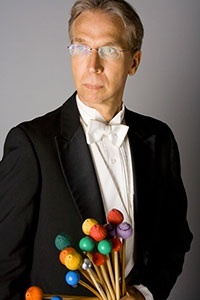 Prior to the Houston Symphony appointment, he held a one year position as principal percussionist of the Grand Rapids Symphony in Grand Rapids, Michigan, and performed as an extra/substitute percussionist with the Pittsburgh Symphony and Philadelphia Orchestra. Born in Pittsburgh Pennsylvania, Brian Del Signore earned a Bachelors of Fine Arts degree from Carnegie-Mellon University in 1981. In 1984, Mr. Del Signore earned a Masters in Music from Temple University in Philadelphia. He began piano lessons at age six and drums at age eleven. His first drum teacher was Lou Carto, pop star Bobby Vinton’s drummer and bandleader. Brian Del Signore is an Artist/Endorser for Remo Corporation, Sabian Cymbals, Pro Mark Sticks, Pearl Drum Corporation, and Black Swamp Percussion. In the education realm, these companies support programs and clinics Mr. Del Signore presents locally and around the country. More information about these educational programs can be found at www.briandelsignore.com.